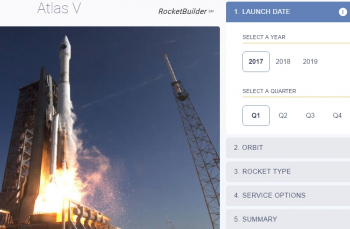 The United Launch Alliance (ULA) has announced an innovative site called “RocketBuilder” which allows customers – and indeed the public – to build a tailormade rocket for their payload. The site will automatically configure a launch vehicle and provide all the associated costs and benefits. 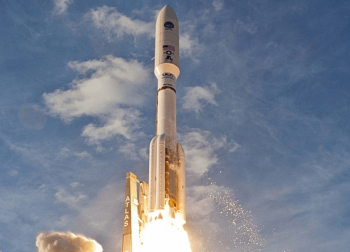 Formed in December 2006 from the merger of Lockheed Martin and Boeing’s rocket production and government launch services divisions, ULA provides and operates all Atlas V, Delta II and Delta IV rockets, mainly used by the US Government – including the armed forces and NASA – but also in the commercial sector. It is about to enter its 10th anniversary. The backbone of launch campaigns for ULA are the stalwart Atlas V and Delta IV rockets. Both of these rockets have impeccable safety records – with the Atlas V actually boasting a 100 percent success rate as deemed by its users. However, ULA is looking into a complete vehicle system replacement for its fleet of Atlas V and Delta IV rockets. At the core of this strategy is the company’s new Vulcan rocket. Due in part to geopolitical and US political considerations regarding Russian-built engines for the Atlas V fleet and also to increasing competition from SpaceX, ULA announced in September 2014 that it had entered into partnership with Blue Origin to develop a new series of liquid oxygen and methane engines for a new first stage booster. 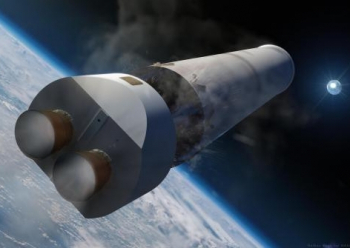 This announcement was followed one month later by ULA’s restructuring of the company and workforce to reduce launch costs by half due to increasing competition in the launch market from SpaceX. It was also during this announcement that the company unveiled plans to blend its existing Atlas and Delta technologies to build a successor for the Atlas V rocket – again, with the principal goal being to cut launch costs in half. At the time, this successor was simply referred to as a next-generation launch system. 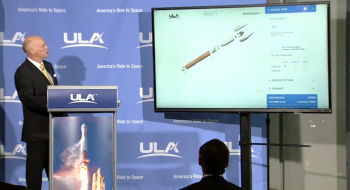 It was not until April 2015 that ULA officially unveiled the launch vehicle as Vulcan. ULA noted that the tool also provides insight into reliability, schedule assurance and performance, allowing users to make a true value comparison. Users have the flexibility to select a launch date, the satellite’s orbit, rocket configuration and the customized service level needed for the mission. Finally, the site will capture savings in extra revenue or mission life, provide the true total cost of the specific mission requirements, and allow users to begin the contracting process. “Today the customer is going to be in the driver’s seat,” noted Mr. Bruno at a launch event in Washington, DC, opening an era when “which rocket/company do we go with” can be made in minutes, not months. He added the tool can allow companies and potential clients to look at cost trade off before they ever pick up the phone. In addition to building a rocket to meet specific requirements, RocketBuilder offers users an industry comparison regarding key value items only ULA can offer, such as unmatched reliability in the form of insurance savings, schedule certainty for increased on-orbit revenue, and orbit optimization with accurate satellite placement that extends the life of the satellite on orbit. Organizations that are in the earliest stages of designing or developing spacecraft will be able to use the information provided on the website to make decisions about their designs and the most cost-effective way to get to space. In demonstrating the tool, Mr. Bruno played the role of a customer. Upon seeing a competitive price, he decided to make his payload heavier. RocketBuilder reconfigured it all for him, added a SRB, bigger PLF – and showed him the cost difference. The pricing tool would typically be used by a commercial customer. ULA’s large role with government customers includes other requirements, such as classified facilities. ULA still have some way to go to compete with the price of SpaceX launches. However, they are closing the gap and hold the claim of 100 percent mission success, which in turn plays into insurance costs. The savings on insurance was played out several times by Mr. Bruno. 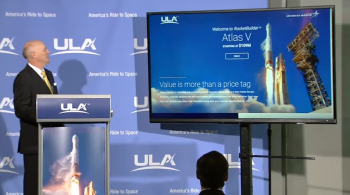 A cited example of a total cost of even less was shown, resulting in Mr. Bruno adding: “$80million for Atlas V 401 makes very competitive, compelling market case when you’re able to finally see the true cost of lift.